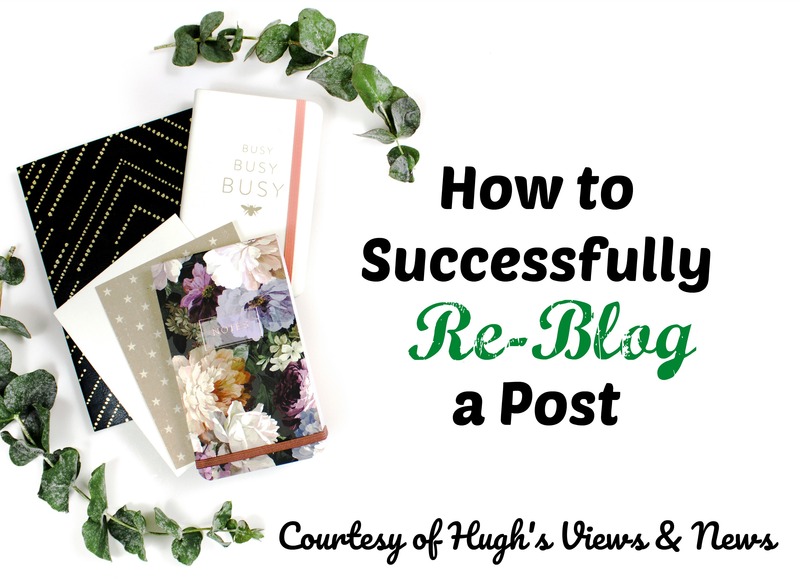 Reblogging a fellow blogger’s post is one of the most flattering forms of sharing! Keep in mind that all of their post’s images will be added to your media files. Something else to keep in mind is to double check the post’s images to be sure you feel comfortable associating them with your blog site. The same copyright rules apply! Once you re-blog, quickly head to your admin page and update the post by adding appropriate categories and tags and set the featured image. If you are unsure, rather than re-blogging, you can always use the “Press This” button on the post, found at the bottom of the sharing option. You might think about installing the “Press This” button into your browser’s toolbar. WordPress has simple instructions for doing this! Using Press This also works for any website you want to share, and for any self-hosted blogger that does not have a re-blog button. When using the Press This option, you will have to create your own image (like I did). In any case, sharing IS caring! Read more on what Hugh has to say about it! Have you ever had one of your blog posts reblogged by another blogger? Here’s what you should do (or should be doing) when a reblog happens. Comments are closed, please visit Hugh’s post for the full story! I don’t really understand this. I share blogs on social media, but not ever to my blog. So if I reblog, it goes on my blog? If so, I would hope people get permission to reblog first! It’s a strange component of WordPress dot com. They encourage sharing post through the reblog feature. So yes, it shows on your blog, which helps bring readers to your own site, via sharing someones else’s info and redirecting to theirs. Pretty genius, actually. Reblogging is considered the pinnacle of sharing–no permission needed since your post gets the credit and the pingback. I didn’t know about any of this Terri so firstly thank you for the information and secondly for linking up with us at #BloggersPitStop. Have a great week! Reblogging is something I learned about last year. I knew about the PressThis button from the dashboard but never saw a reason to use it. It was when I read a post on how to reblog from a self-hosted site that I finally understood the value of it. It’s similar to curating content. You make a featured image, you give your thoughts about the post, give credit to the source, and then hit publish. I’m glad you enjoyed my reblog of Hugh’s post, Sara! Seems simple enough and always great for sharing and connecting in the blog world. Reblogging is a bit dicey .But other than the canonical tag I have enabled only excerpt sharing .That way if someone dies reblogs their reader will have to click through to my site to read the full story . wow – you have such beautiful post along with your blog, you are sharing a great features.. Always interested in learn something new or seeing how other bloggers do things. HI Leanne, yes that could be a conundrum. Not sure how Blogger addresses that sharing issue! Thanks so much for ‘pressing’ and sharing my recent post on reblogging, Terri 😀 The post has picked up lots of interesting comments (including yours). I know, I saw and read some of them! Isn’t that the idea? Engagement? High five to you for getting this conversation started! Hi Terry, I have meaning to tell you that the reblog of your book is still getting clicks. At least two friends told me they had downloaded your book. Thanks again for sharing and reblogging, BL! I hope they find the info useful! Hope you’re having a great day! I guess I’ve never run into this before besides reading some of yours. What’s the advantage/disadvantage to this as opposed to just linking to their post? The reblog feature seems to be limited to those who blog on WordPress dot com, the hosted site. I guess for ease of sharing!